Insulation you get through still air. A wall cavity insulates, if the air is not (fast) refreshed. The air can be trapped in double glass, rock wool, etc. Also wool, cork, hay, straw, etc. can help here as long as they stay dry. Mice and wasps find it ideal nesting sites. You can make the best use of the natural conditions by providing on the north side for example, a storage room or basement. The shady, moist exterior is used to grow mushrooms. Solar heat can give most profit by (large) windows or greenhouse facing south. They can also lie a bit east or westward. Facing south is often too hot. That excessive heat in the summer you can avoid by providing shade as from a lime tree(espalier), or climbing plants like hops act as air conditioning through their leaves in summer. In winter the branches or vines again let pass the sunrays. Overall, you could say that 1°C less heat gives you about 10% fuel savings. Wood wool, straw (bales), cork, hemp, flax wool and wool (and felt) are natural organic materials of which insulation panels are made. How ecological they are also depend on any used additives and binders (cement, glue). (Because cotton is mostly grown environmentally unfriendly, recycled cotton is not eco.) 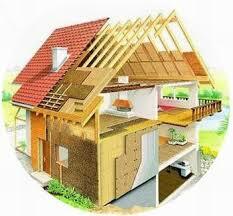 Just like rock wool and other insulation you have to keep it dry, and free of rodents, birds and insects. Cover access holes with non-rusting fine metal mesh or perforated foil or plate.